Twitter is more than few characters of text. You can also share your favorite photos, videos withTwitter friends. 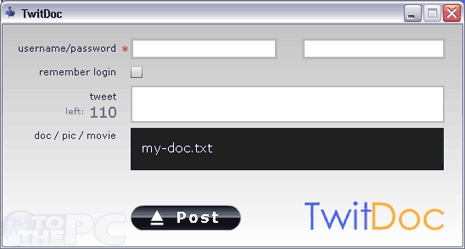 TwitDoc desktop client makes document and file sharing very easy. Using this program you can upload and share documents, files, photos and videos from desktop with your Twitter friends. 1. Download TwitDoc program & install it (Adobe Air app). 2. Launch the program to use it. 3. Enter your Twitter username and password. 4. Type the Tweet message you want send along with specific file. 5. Drag drop document, photo or movie file for quick uploading. 6. Click Post to see your Tweet on Twitter timeline along with link to open and view upload file or document.